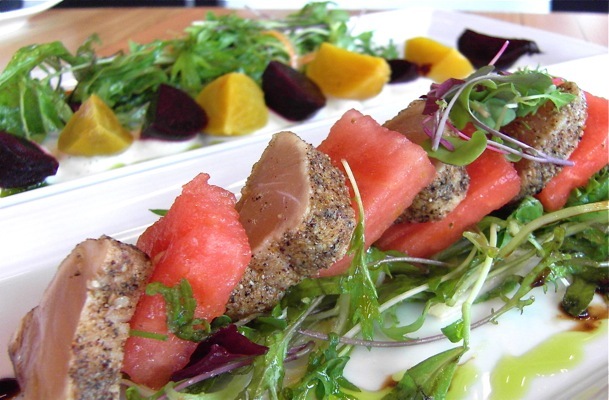 Looking for the best restaurant on Granville Island? You should give Edible Canada’s Bistro a shot. Despite this “bummer summer” — as many are calling it — Vancouver remains one of the most beautiful cities in the world, and we’ve just got to make the best of it. Perhaps if we partake in sunny day activities, our weather will follow suit? I suggest plunking down amidst the bustle of day trippers at Granville Island’s brand new bistro — Edible Canada at The Market — for a bite of something local and delightful. The Slik Spiced BC Albacore Tuna’s flavour layered coating — about umpteen spices thrown together — is sold in the adjoining retail shop, which is filled with nothing but top quality food products. Paired with watermelon and green oregano olive oil, the chilled albacore dish practically quenched my thirst, not to mention my craving for edible gratification. Another dish to savour while you envision picnic conditions is the baby beets and their bed of satiny goat cheese.